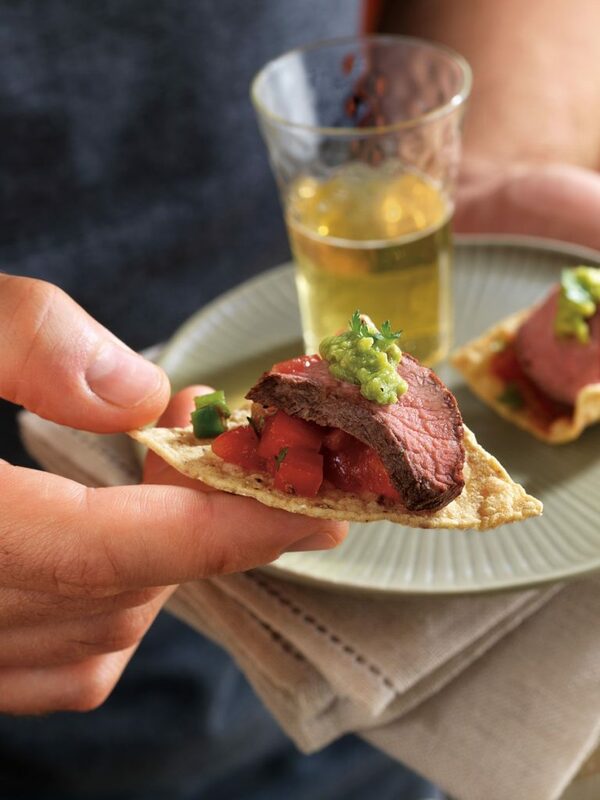 Tender Flat Iron Steak gets a flavor kick from a simple salsa marinade before being sliced and placed atop corn chips for an impressive appetizer. Place beef steaks and 1/2 cup salsa in food-safe plastic bag; turn steaks to coat. Close bag securely and marinate in refrigerator 15 minutes to 2 hours. Combine remaining 1/2 cup salsa and chopped cilantro, as desired; cover and refrigerate until ready to use. Nutrition information per serving: 59 Calories; 3g Total Fat; 1g Saturated Fat; 1g Monounsaturated Fat; 12mg Cholesterol; 134mg Sodium; 5g Total carbohydrate; 4g Protein; 0.5mg Iron; 0.5mg Niacin; 0.1mg Vitamin B6; 0.8mcg Vitamin B12; 1.3mg Zinc; 5.4mcg Selenium; 0.6g Fiber.